A1C Test Could Misdiagnose Diabetes In African-Americans : Shots - Health News People with sickle cell trait, which includes about 10 percent of African-Americans, can get erroneous readings on a common blood glucose test. That could mean they miss out on diabetes treatment. 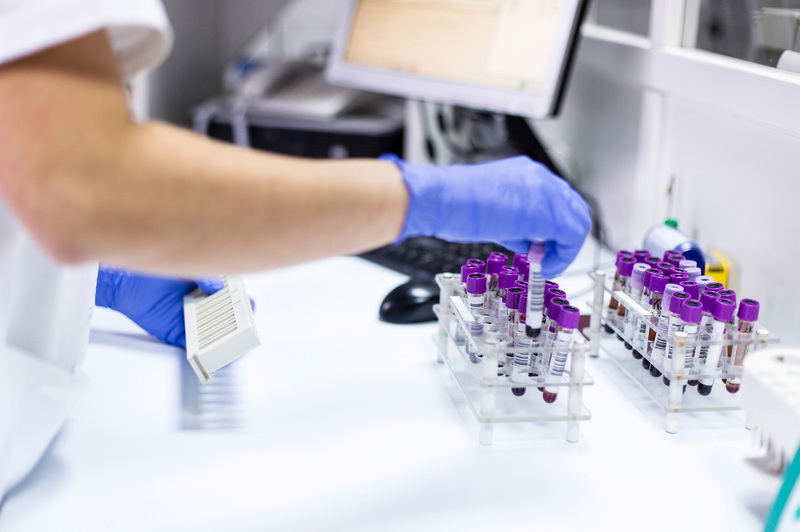 The hemoglobin A1C test for blood sugar, a standard assay for diabetes, may not perform as well in people with sickle cell trait, a study finds. Glucose levels in the blood rise and fall all the time, so it can be tricky to look at a single exam to diagnose diabetes or manage the disease in people who have it. But one test gets around this problem. The A1C test measures sugar that binds to hemoglobin molecules in red blood cells. It provides an average of blood sugar over the past three months, "so this has turned out to be an incredibly powerful test, both for the diagnosis and treatment of diabetes," says Dr. Anthony Bleyer, a kidney specialist at the Wake Forest School of Medicine who was not involved in the study. The problem is that the test results can vary, depending on circumstance. For example, people with anemia may get inaccurate readings. So do people who carry unusual types of hemoglobin, the best known being sickle cell trait. Eight to 10 percent of African-Americans carry the sickle cell trait. But only people who inherit two copies of the sickle cell trait, one from each parent, develop the disease. And a few years ago, scientists realized that A1C readings for African-Americans typically don't match those from whites. They are generally higher. "The test was really standardized based on white individuals, and there were just a small number of African-American individuals in that study," Bleyer says. And while the difference isn't large, it can matter a lot, especially for people who are close to the line that defines diabetes. Someone who appears to be just under the line and diagnosed as having prediabetes may in fact have a higher level of A1C, which would push them into a diagnosis of diabetes. Vagaries in these readings can also be misleading for people whose treatment is guided by this test, because doctors may be overly aggressive in controlling blood sugar, to the point that a patient can end up with seriously low blood sugar. In a report published Tuesday in JAMA, the journal of the American Medical Association, scientists at Brown University and the National Institutes of Health examined data from two large studies to compare test results of African-Americans with and without the sickle cell trait. The studies used standard A1C tests that had previously been shown to give low readings for people with the sickle cell trait. The scientists were surprised to find how big a difference it made. About 4 percent of the people in the study who carried the sickle cell trait were diagnosed with diabetes, but they expect a test corrected for bias would have identified about 7 percent — nearly twice as many people. "We were really shocked by that, honestly," says Mary Lacy, a graduate student at Brown University and lead author of the study. "That's huge!" Likewise, they found 40 percent fewer cases of prediabetes than they expected among people carrying the sickle cell trait. The test readings are only off by a few tenths of a percentage point, but that was enough to push many people below the cutoff points that indicate diabetes or prediabetes. This observation is one reason doctors should be cautious in interpreting A1C results, researchers say. "Doctors generally take the test fairly literally," says Tamara Darsow, senior vice president for research and community programs at the American Diabetes Association. "How much this impacts care and the interpretation of A1C results I think is variable." The association's guidance document cautions doctors that the A1C tests can be off by plus or minus 7 percent among people with unusual hemoglobin traits. As the new study underscores, that is more than enough variability to affect a diagnosis. So instead of making a snap diagnosis, particularly for African-Americans, doctors could additionally run some more traditional blood-sugar tests. Those aren't influenced by race or sickle cell status (though they can vary for other reasons). "Information together from all of these tests can be much more powerful than those taken in isolation," Darsow says. The American Diabetes Association would ultimately like to come up with more concrete treatment guidelines, but for now their word to doctors is this: Be aware this is an issue and use your best judgment.